Hop on board and enjoy the ride with the Motorhead Slot Game! 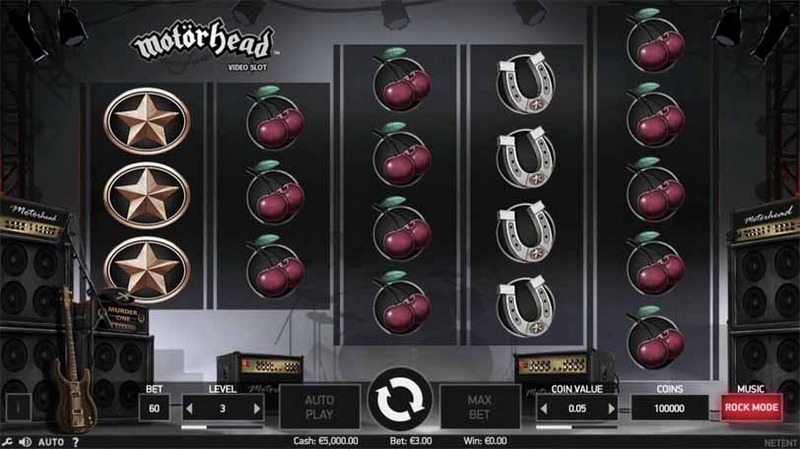 One of the newest video slot machine games on the market today is Motorhead, based on the band of the same name. The game was created after the death of one of the bandmates in late 2015. Those who enjoy the music of Motorhead will likely flock to its slot machine game. The introduction seen when the game is launched is black and white footage of a Motorhead concert. When the game starts, players will be able to hear four of the band’s songs included in the game, the symbols represent the band as well. For example the game’s wild symbol is Ace of Spades. The three features included in the game are Mystery Reel, Free Spins and Bombers. Anytime the reels are spun it is possible that the Mystery Reel feature will be triggered. It can appear either during normal game play or during free spins. Players will see one or more on their screen. Whenever the Mystery Reel Feature is activated it turns the reels into stacked ones. Symbols on the reels are then changed randomly, often resulting in winning combinations. Players are always on the lookout for at least three of the scatter symbol to appear on the third, fourth and fifth reels, which leads to free spins. Though free spins cannot be re-triggered during this round players still have the potential to win big. The Bomber Feature is triggered at random times during normal game play and bonus game play. When this feature is triggered during normal game play it adds random overlay symbols to the reels; the most that would appear are 10 symbols. However, when this feature is triggered during a bonus players may get 15 overlay symbols on the reels at once, greatly increasing their winnings. These features make Motorhead an exciting adrenaline rush that fans of the band can’t resist trying their luck at. If you're unsure about Gambling Addiction, take this short questionnaire from Gamblers Anonymous. Play all of the latest slot games at Casino Room today. New customers can claim a £200 welcome bonus!